Reality Based Self Defense refers to systems of self defense that focus exclusively on reality based self defense scenarios and conditions. Hence the words "reality based." Unlike martial arts, reality based self defense is not a hobby or sport and it does not participate in tournaments or sport combat competitions. It's all about learning how to avoid, de-escalate, escape and, if required, to fight. What Makes a Reality Based Self Defense System? Therefore, reality based self defense must include a broad range of training curriculums that address the many complex issues of modern day conflict and crime. As a result, reality based self defense must integrate numerous sciences and disciplines into its training curriculum. Places are limited to 30 and you need to register and pay upfront for the event. ​To register or to obtain more information fill in the form below. Roan Theron’s experience as trainer/instructor, years of martial arts training (training and national and international competitions) is backed by years of experience where he had to apply his skills while working as a close protection officer on high-risk contracts and venue security officer at some of South Africa's most notorious nightclubs in the late 90’s to early 2000’s. In 1997, Roan’s first reality-based self-defence school opened in South Africa, and evolved into the Personal Protection Academy (PPA) doing extensive consulting and training work for the South African Police Services and the close protection and 'safer door' community in South Africa. 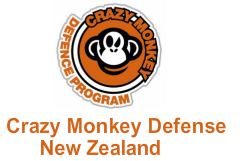 Before emigrating, Roan trained with Rodney King (Crazy Monkey Defense founder) and then opened his own Crazy Monkey Defense gym when he arrived in New Zealand. Subsequently he relocated to Melbourne and still training with others in the city to keep his own game up. "Having trained and coached martial arts for over 20 years I am very passionate about my clients’ training and coaching of others. I am a big believer in working with ones strengths in a safe yet FUNctional environment and coach Martial Arts through a positive methodology, with the honor and integrity it deserves. I have a diverse group of clientele ranging from Law Enforcement, Security Personnel, IT Professionals, Corporate groups and everyday people.